This site is dedicated to the thousands of people across the United States who have been able to realize their dreams of flying through the FAA's Sport Pilot Rule. All across America, people who always wanted to learn to fly, but who were discouraged by the time, expense and difficulty required to obtain a Private Pilot certificate, have found the Light Sport Pilot program to be their ticket to the air. The Sport Pilot Rule provides a faster, easier, and less expensive way for individuals to learn to fly very light, very simple aircraft (called "Light Sport Aircraft, or LSA for short) under daytime, good-weather conditions. In short, the SP Rule attempted to bridge the worlds of ultralight aviation and the tradition general aviation community. Ultralight pilots, who had previously operated in a Wild-Wild West world where there was practically no regulation of their operations, would be offered the opportunity to become "real," licensed pilots -- and thus brought under FAA supervision. In return, they would receive additional privileges, such as the ability to fly larger aircraft and to carry a passenger. To understand how the SP Rule works, it's helpful to understand a bit of the history behind it. In 1983, The FAA adopted Part 103 of the Federal Aviation Regulations, which governed the operation of "ultralight vehicles," commonly called "ultralights." Part 103 defined what ultralights were and promulgated parameters within which they could be operated, by practically anyone, with no particular training, licensing, aircraft inspection, or registration requirements. Among the various regulations defining an ultralight was that they had to be single-place (that is, capable of carrying only the pilot). This, of course, presented an obvious problem: How does one learn to fly an ultralight if two-place ultralights are illegal? The FAA responded by granting exceptions to the U.S. Ultralight Association (USAA) and the Experimental Aircraft Association (EAA) that allowed two-place ultralights to be used strictly for instructional purposes. As might be expected, abuses of these exceptions commenced almost immediately, but they usually were minor enough that FAA largely looked the other way. Most often these abuses consisted of someone calling their friend or relative a "student" and logging a purely recreational flight "instruction" in order to get around the single-seat rule. As long as some instruction was provided (which actually was the case most of the time, human nature being what it is), it was technically legal. Toward the end of the 1990's, however, the abuses had become more widespread and more blatant. Some ultralight operators were basically operating sightseeing, aerial photography, or even air taxi businesses -- without the training and certifications usually required for these activities -- all under the guise of providing "instruction" to their customers. Although it was rarely discussed in quite so blunt terms, a very high percentage of ultralight pilots were not eligible for FAA medical certificates. A great many others might be able to get "Special Issuance" medical certificates, but either couldn't afford the cost of the medical tests that would be required (which could run into thousands of dollars in some cases), or simply couldn't be bothered jumping through the hoops. Ultralight pilots, however, have never been required to have medical certificates of any kind, nor to meet any particular medical requirements. 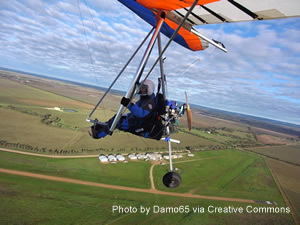 The theory's always been that any risk inherent in flying ultralights was mainly to the people flying them. Because of the low weight, limited fuel capacity, and operational restrictions imposed on ultralights, they presented little risk to others or to aviation in general. But this theory assumed that ultralight pilots were following all the rules of FAR 103. And frankly, a lot of them weren't. Any attempt to bring ultralight pilots were to be brought "into the fold," therefore, had to work around the fact that a large percentage of ultralight pilots would have difficulty obtaining medical certificates. The FAA's answer was to allow Sport Pilots to use their drivers' licenses as medicals. You can read more about this requirement here. The FAA decided it had to do something, and what they did in 2004 was adopt FAR 61 Subpart J, more affectionately known as the Sport Pilot Rule; along with FAR 61 Subpart K to regulate Flight Instructors with a Sport Pilot Rating. Changes were also made to other parts of the FARs to define Light Sport Aircraft and create new certifications for Repairmen and Inspectors of LSA. The changes brought about by the SP Rule were many, but in practical terms, it placed all operations formerly conducted under Part 103 under direct FAA control, with the sole exception of flying single-place ultralights. That remained the same. You can still fly a single-place ultralight qualified under Part 103 with no required training, certification, inspection requirements, or registration. On the other hand, the SP Rule did away with two-place ultralights (they would have to be registered and numbered as LSA) and the EAA and USUA training exemptions. In addition, an FAA Instructor certificate would be required to give instruction in LSA, and a Pilot certificate would be required to operate an LSA. On the positive side, Sport Pilots are able to legally carry a passenger, whereas ultralight pilots were never able to do so; and LSA, although still quite small, are allowed to be much bigger than ultralights ever were. The Sport Pilot Rule was adopted mainly to give the FAA some control over the ultralight aviation community, but it also has created opportunities for more people to realize their dream of learning to fly, for a number of reasons. Sport Pilot training requires a minimum of 20 hours of flight training (for SP with Airplane privileges), compared to 40 hours for a Private Pilot (Airplane, Single-Engine) certificate. This can dramatically reduces the cost of earning your wings. FAA's definition of a "Light Sport Aircraft" includes machines ranging from those that look like traditional ultralights, to airplanes having the look, feel, and comfort of more conventional aircraft. The Sport Pilot certificate is a real, honest-to-goodness, FAA pilot certificate. Therefore, all flight hours accumulated by Sport Pilots count toward meeting applicable requirements for more advanced pilot certificates and ratings. Dual training time may also count toward a Private Pilot certificate, provided that the training was provided by a Certified Flight Instructor who was authorized to provide training at the Private Pilot level. In summary, the Sport Pilot Rule was primarily intended to bring the ultralight community into the FAA fold, but it also has opened up the opportunity for many people new to aviation to realize their dreams of flight.